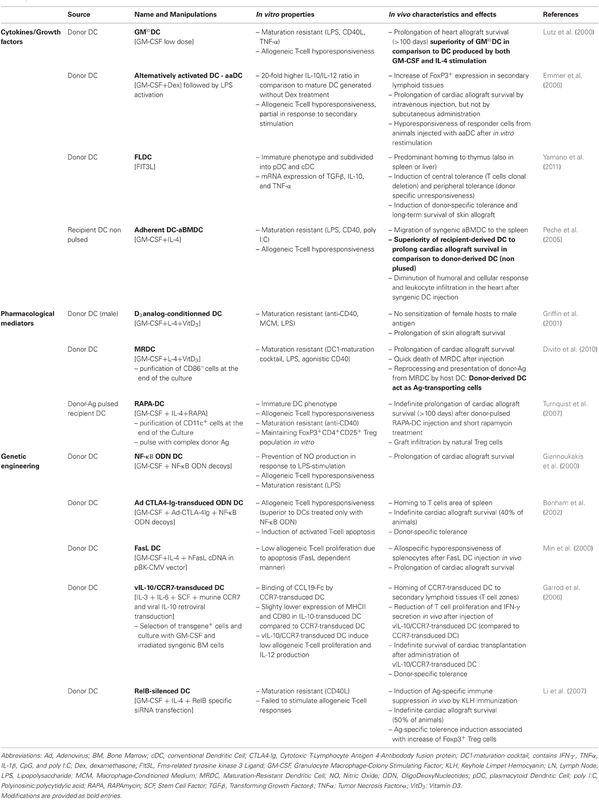 Translating tolerogenic therapies to the clinic – where do we stand and what are the barriers? The use of immunosuppressive (IS) drugs to treat transplant recipients has markedly reduced the incidence of acute rejection and early graft loss. However, such treatments have numerous adverse side effects and fail to prevent chronic allograft dysfunction. In this context, therapies based on the adoptive transfer of regulatory cells are promising strategies to induce indefinite transplant survival. The use of tolerogenic dendritic cells (DC) has shown great potential, as preliminary experiments in rodents have demonstrated that administration of tolerogenic DC prolongs graft survival. Recipient DC, Donor DC, or Donor Ag-pulsed recipient DC have been used in preclinical studies and administration of these cells with suboptimal immunosuppression increases their tolerogenic potential. We have demonstrated that autologous unpulsed tolerogenic DC injected in the presence of suboptimal immunosuppression are able to induce Ag-specific allograft tolerance. We derived similar tolerogenic DC in different animal models (mice and non-human primates) and confirmed their protective abilities in vitro and in vivo. The mechanisms involved in the tolerance induced by autologous tolerogenic DC were also investigated. With the aim of using autologous DC in kidney transplant patients, we have developed and characterized tolerogenic monocyte-derived DC in humans. In this review, we will discuss the preclinical studies and describe our recent results from the generation and characterization of tolerogenic monocyte-derived DC in humans for a clinical application. We will also discuss the limits and difficulties in translating preclinical experiments to theclinic. The success rates of transplant surgery have significantly improved over the past fifty years. However, without treatment, the development of an immune response against the donor organ by the transplant patients leads to graft destruction. To block this immunological response and protect the transplanted organs from rejection, a range of general immunosuppressive drugs (IS) is necessary. Unfortunately, the use of IS drugs induces numerous adverse side effects, increasing the risks of infection and cancer (Dantal et al., 1998). The aim of research in transplantation today is to find an approach to induce long-term acceptance of transplants in the presence of minimal IS drug exposure. Cell therapy appears to be an innovative and promising strategy to address these problems (Bluestone et al., 2007). A European project called the “One Study” has been set up to test the efficacy of different immunoregulatory cell products in organ transplant recipients. In our center, tolerogenic dendritic cells (DC) will be injected into humans in an attempt to achieve donor-specific tolerance. DC are potent antigen-presenting cells (APC), able to induce either immunity or tolerance. After a brief description of the different types of mouse DC present in vivo, we will describe how tolerogenic DC can be derived in vitro in different animal models, and their efficacy in transplantation models. In the last part of this section, we will discuss the mechanisms of tolerance induced by TolDC. DC are present in small numbers in vivo and are mainly localized in the spleen and lymph nodes (LNs). DC are a heterogeneous population of cells that can be classified into two main subsets: conventional DC and plasmacytoid DC. Conventional DC can be either resident or migratory cells. Resident DC are present in the spleen, LNs and thymus. In the steady state, these DC are immature and become mature in the presence of danger signals. They can be divided into three subsets: CD4+CD8−, CD8α+ (DEC205+), and double negative, CD4−CD8−DC. They also differ in their methods of antigen (Ag) presentation. For example, CD8α+ resident DC are able to cross-present exogenous Ag on MHC Class I (den Haan et al., 2000). Thus, they mainly activate CD8+ T cells and produce high levels of IL-12, which leads to a type 1 response (Hochrein et al., 2001; Reis e Sousa et al., 1997). On the contrary, CD4+ resident DC present Ag on MHC Class II and mainly stimulate CD4+ T cells (Dudziak et al., 2007). In lymphoid organs, resident DC capture and present Ags to T cells. In contrast, migratory DC capture Ags in peripheral tissues and then migrate to LN where they present Ag to T cells. The most frequently described migratory DC are Langerhans cells present in the epidermis, although other migratory DC are also localized in the dermis and intestine. An inter-DC Ag transfer function was suggested by Allan et al. (Allan et al., 2006). In this context, migratory DC would bring Ag to LN, where resident CD8+ DC would efficiently present this Ag and induce CTL priming. Plasmacytoid DC on the other hand, are actors of the immune response in the context of viral infections. These DC recognize viral DNA and RNA via TLR (Toll-Like Receptors) 7 and TLR9. Upon activation, plasmacytoid DC present Ag and produce high amounts of type 1 interferons. In contrast to the different subsets of DC previously described, a last population of DC, called inflammatory DC (iDC), is not thought to exist in the steady state but to be produced in vivo in response to inflammation. A recent study by Cheong et al. showed that inflammatory DC originate in LN from circulating monocytes (Cheong et al., 2010b). Like the other DC, iDC are able to cross-present Ag by MHC Class I and stimulate naive or Ag-memory T cells (Cheong et al., 2010b). Interestingly, GM-CSF is essential for the generation of these DC as mice deficient in GM-CSF do not generate DC from monocytes in their spleen (Shortman and Naik, 2007). The dogma described in the literature is that immature DC are tolerogenic and mature DC are immunogenic (Probst et al., 2003). However, some properties of mature cells, such as Ag presentation to T cells and in vivo migration to lymphoid organs, are also found in certain tolerogenic DC (TolDC). Thus, TolDC could be either immature, maturation resistant, or alternatively-activated cells (Ezzelarab and Thomson, 2011). In most protocols, mouse DC are derived from bone marrow (BM). The conventional cytokines used to derive DC from precursors are GM-CSF and IL-4. However, a study performed in mice in 2000 showed that DC generated with low doses of GM-CSF in the absence of IL-4 have the properties of immature tolerogenic DC. These cells have a high capacity for Ag capture/presentation and induce a low level of allogeneic T cell proliferation. Furthermore, they are maturation-resistant and increase graft survival after in vivo injection (Lutz et al., 2000). Various DC manipulations ex vivo have been described to generate TolDC. For example, treatment of DC with Dexamethasone, VitaminD3, IL-10, TGF-β, rapamycin, LPS, or gene transfer (Morelli and Thomson, 2007) has been shown to increase their efficacy and block the maturation process (see Table 1 for details). Table 1. Examples of protocols used to generate BM-derived DC with tolerogenic properties in rodents—application in transplantation. Compared to the different types of DC described in vivo, TolDC generated in vitro should be similar to inflammatory DC, as these cells are not normally found in the steady state but are present in vivo in a context of inflammation (Shortman and Naik, 2007). Furthermore, inflammatory DC need GM-CSF for their differentiation and this cytokine is also essential for the in vitro generation of TolDC. While DC are derived from BM in rodents, monocytes are used in humans. To compare the importance of the precursors in the generation of tolerogenic DC, non-human primate models can be used. In most studies, DC are derived from peripheral blood monocytes. After CD14 positive selection, monocytes are cultured with GM-CSF (800–1000 U/ml) and IL-4 (500–1000 U/ml) to obtain DC (O'Doherty et al., 1997; Barratt-Boyes et al., 2000; Asiedu et al., 2002; Ashton-Chess and Blancho, 2005; Mortara et al., 2006; Zahorchak et al., 2007). In parallel, two studies have shown the possibility of deriving DC from CD34+ bone-marrow precursors (Pinchuk et al., 1999; Ashton-Chess and Blancho, 2005). Using cynomolgus macaques, we compared the generation of DC from monocytes and from BM (either from total cells as for rodents or from CD34+ precursors) (Moreau et al., 2008). Our results showed that the DC phenotype and function vary according to the origin of the precursors. As such, DC generated from monocytes (MoDC) have a more homogeneous phenotype with all cells expressing CD86. In BM derived DC, only half of the cells are CD86 positive, regardless of whether the CD34 precursors are isolated or not. However, neither MoDC nor BMDC express the maturation marker CD83, suggesting that these cells are semi-mature DC. In terms of their function, macaque MoDC induce less proliferation of freshly isolated natural Tregs than their BM-derived DC counterparts (Moreau et al., 2008). Another study performed in our center compared the generation of baboon DC from monocytes or from CD34+ BM precursors. The authors also concluded that different DC were obtained depending on the precursor cell-type (Ashton-Chess and Blancho, 2005). In transplantation, DC present donor Ag to recipient T cells either by the direct pathway, the indirect pathway or the semi-direct pathway. By the direct allorecognition pathway, donor DC present donor peptide/donor MHC molecules to T cells, this type of Ag presentation is mainly associated with acute graft rejection. In contrast, the indirect pathway is defined by the presentation of donor peptide by recipient MHC molecules and is thought to induce chronic rejection. In the semi-direct allorecognition pathway, recipient DC present donor MHC molecules (transferred from donor cells) to T cells (Herrera et al., 2004; Smyth et al., 2006). 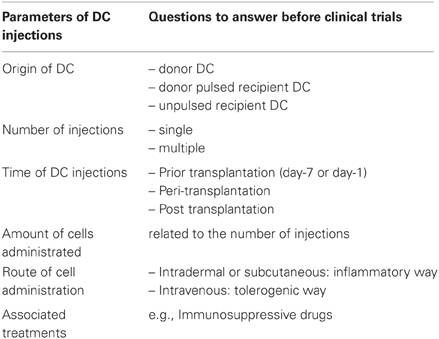 In order to achieve donor-specific tolerance using DC therapy in transplantation, both donor tolerogenic DC (direct pathway) or recipient tolerogenic DC loaded with donor peptides (indirect pathway) have been tested in animal models of transplantation. The efficacy of these different types of DC has been demonstrated in rodent models, as described in Table 1 (Morelli and Thomson, 2007; Ezzelarab and Thomson, 2011). Recently, Morelli's group demonstrated that injected donor DC are actually unable to directly regulate donor-specific T cells in vivo in mice. In fact, after injection, donor tolerogenic DC die quickly and the donor Ag is reprocessed and presented by the host DC via the indirect pathway (Divito et al., 2010). In this context, donor DC mediate their suppressive effects on T cells through endogenous conventional DC from the recipient mouse (Wang et al., 2012). These results indicate that injected donor TolDC act as “donor Ag transporting cells”, which could be related to the DST (donor specific transfusion) protocol. DST, which consists in injecting donor blood into the recipient before transplantation, is still used in the clinic. Some studies have shown that DST improves graft survival and function (Sharma et al., 1997; Marti et al., 2006). In parallel, we demonstrated in a rat model of fully MHC-mismatched cardiac allotransplantation that injection of unpulsed recipient DC the day before the transplant induces longer graft survival than the injection of donor DC (Peche et al., 2005). To improve the system and to create clinically applicable conditions, recipient DC were then injected into rats treated with a suboptimal dose of the IS drug, LF15-0195 (Beriou et al., 2005). This deoxyspergualin analog is known to inhibit DC maturation by blocking NF-κB activation (Yang et al., 2003). Both recipient DC and LF15-0915 have a synergic effect and this co-treatment induces tolerance to the allogeneic heart transplant in 90% of treated rats. We then investigated whether the tolerance was donor-specific. To answer this question, tolerant rats received syngeneic, donor or third-party skin grafts at 100 days post heart transplantation. Only the third-party skin graft was rejected, showing that the tolerance induced by recipient TolDC + LF 15-0195 was donor specific (Beriou et al., 2005). To confirm the efficacy of cell therapy using recipient TolDC, we generated TolDC in mice (Segovia et al., 2011) and in non-human primates (Moreau et al., 2009). As previously shown in rats, injection of mouse recipient TolDC associated with a transient anti-CD3 treatment prolonged graft survival in both skin and pancreatic islet transplantation models (Segovia et al., in preparation). In macaques, we showed that TolDC are able to expand Treg in vitro (Moreau et al., 2008). TolDC are thought to exert their actions using different mechanisms. First, these cells can induce either T cell anergy or clonal deletion. T cell anergy occurs when DC lacking costimulation molecules interact with T cells. In the presence of Ag but without costimulatory signals, T cells become anergic and lose their ability to proliferate (Schwartz, 1997; Lechler et al., 2001). On the other hand, TolDC can induce T cell apoptosis. One mechanism described to induce this clonal deletion is an over-activation of T cells, called AICD (Activation Induced Cell Death). The Fas/Fas ligand pathway (Lu et al., 1997), but also expression of IDO (indoleamine 2,3-dioxygenase) (Mellor et al., 2003) by DC, leads to AICD in effector T cells. The T cells targeted by clonal deletion are either naive or memory cells (Kenna et al., 2008). Another major mechanism of action of TolDC is the generation/expansion of regulatory T cells. Some studies have shown the ability of GM-CSF-derived DC to induce expansion of natural CD4+CD25+FoxP3+ Treg (Yamazaki et al., 2003; Emmer et al., 2006) whereas others have shown the ability of TolDC to generate Treg from naive CD4+CD25− T cells (Fujita et al., 2007). In parallel, the generation of Tr1 by TolDC has also been demonstrated (Wakkach et al., 2003). Molecules expressed by TolDC, such as IDO or Galectin-1, have been shown or suggested respectively to be involved in the generation/expansion of regulatory T cells (Hill et al., 2007; Ilarregui et al., 2009). As the half-life of DC is short, the generation/expansion of Treg is an important mechanism. Indeed, Kendal et al. recently showed that Treg can maintain an infectious tolerance by de novo generation of Foxp3+ Tregs from naive CD4+ T cells (Kendal et al., 2011). Besides the involvement of IDO expression by TolDC described in the two previous paragraphs, TolDC have also been shown to express tolerogenic markers such as HO-1 (Heme Oxygenase-1) and EBI3 (Epstein-Barr virus-Induced gene 3). Expression of HO-1 was demonstrated to correlate with DC maturation state (Chauveau et al., 2005) in that immature tolerogenic DC expressed high levels of HO-1, and this molecule enabled tolerogenic DC to inhibit allogeneic T cell proliferation. In both rats and macaques, blockade of HO-1 in TolDC impaired their ability to suppress T cell proliferation in vitro. Furthermore, in our model of tolerance to heart transplantation using both recipient TolDC and LF15-0195, blockade of HO-1 prevented tolerance induction (Moreau et al., 2009). EBI3+, another marker expressed by TolDC, also has a crucial role. In a rat cardiac allotransplantation model developed in the laboratory using syngeneic TolDC, an increase in double-negative T cells (TCRαβ+, CD3+, CD4−CD8− NKRP1−, DNT) was observed in the spleen of tolerant mice. These DNT cells produced IFN-γ, which was essential for the tolerance induction, as anti-IFN-γ treatment of recipient mice led to the loss of tolerance induction (Hill et al., 2011). To investigate how injection of TolDC mediates IFN-γ production by DNT and tolerance induction, we identified the possible regulatory cytokines produced by TolDC. Our results showed that TolDC express EBI3. By using anti-EBI3 antibody and EBI3 siRNA, we demonstrated that expression of EBI3 by TolDC is essential for IFN-γ production by DNT cells. Furthermore, in our in vivo model of tolerance induction using TolDC, anti-EBI3 treatment of the recipient mice induced graft rejection, highlighting the key role of EBI3 expressed by TolDC in tolerance induction (Hill et al., 2011). It is important to note that the cytokine IL-35 is made up of EBI3 and p35 subunits. It has previously been demonstrated that IL-35 is secreted by regulatory T cells (iTr35+ cells) and contributes to their regulatory function (Collison et al., 2007; Niedbala et al., 2007; Collison et al., 2010; Chaturvedi et al., 2011). As we had proved the relevance of using unpulsed recipient TolDC to induce donor-specific tolerance in several animal models, we wanted to understand the mechanisms of action of these cells. In contrast to most studies using TolDC (donor TolDC or donor-pulsed recipient TolDC), recipient TolDC were injected the day before transplantation (instead of one week before). After injection, recipient cells migrated rapidly to the spleen and were still detectable in this organ 15 days later (Peche et al., 2005). In parallel, donor derived MHC ClassII+ cells (OX3+) from the graft were present in the spleen 3–5 days post transplantation and seemed to interact with the injected TolDC. We hypothesized that injected recipient TolDC were able to process the donor Ag at this stage. To reinforce this hypothesis, we depleted graft passenger leukocytes (interstitial DC) from the donor hearts by administration of cyclophosphamide to the donor rat before transplantation. In this context, treatment of recipient animals with unpulsed recipient DC and LF15-0195 failed to induce any graft prolongation (unpublished results). However, the effect of recipient DC and LF15-0195 was rescued when donor splenic APC were injected in this model. These results highlight the essential role of graft passenger leukocytes in recipient TolDC therapy. Studies performed in rodents ensured the characterization and the efficient use of TolDC in vivo. The goal today is to transfer this knowledge to humans in order to treat patients with tolerogenic DC. However, even though it is technically possible to derive DC from BM in humans (Berger et al., 2009), the culture of peripheral blood monocytes appears to be a reliable means to generate DC in humans. As described above, we know from studies in non-human primates that the different origin of tolerogenic DC in rodents and human can limit their comparison. Protocols of human MoDC generation are based on the knowledge acquired in animals. In most cases, human MoDC are obtained by culture of monocytes with GM-CSF and IL-4. However, more recently, human MoDC generated in the presence of GM-CSF and without IL-4 were described to have tolerogenic properties in vitro, like their counterparts in mice (Lutz et al., 2000; Chitta et al., 2008). Furthermore, as in animal models, other protocols have been reported to derive human tolerogenic DC from monocytes in the presence of pharmacological agents such as IL-10 or rapamycin (Morelli and Thomson, 2007; Gregori et al., 2010; Turnquist et al., 2010; Ezzelarab and Thomson, 2011). To generate human TolDC for clinical trials, we decided to use a simple protocol. We derived human TolDC from monocytes (0.5 million/ml) cultured in AIM V medium supplemented with low-dose GM-CSF (100 U/ml) for 6 days. In this protocol, monocytes are enriched from leukapheresis of peripheral blood by elutriation (purity around 90–95%). Elutriation is a purification technique that separates cells based on their size and density (Berger et al., 2005). This cell separation technique enriches untouched monocytes in a closed and disposable system that is adapted for GMP (Good Manufacturing Practice) facilities. The advantages of using elutriation instead of bead selection are that the cells are untouched and there is no risk of injecting extra components (i.e., beads) to humans. The disadvantage of elutriation is a lower degree of cell purity, although this is not a real problem when autologous cells are injected. After one week of differentiation, human TolDC are more than 90% MHC-II+ and less than 2% contaminated with T cells, B cells, or NK cells. These TolDC are hypostimulatory and do not over-express CD80 or CD86 markers and remain CD83 negative after LPS/IFN-γ stimulation. Furthermore, upon stimulation, TolDC secrete very low doses of IL-12 but are able to produce IL-10. Interestingly, as we described previously in rats (Hill et al., 2011), human TolDC also express the tolerogenic marker EBI3 after stimulation. These results suggest that our protocol generates tolerogenic DC that are semi-resistant to maturation, which is essential to ensure that they will not mature and become immunogenic once injected into patients. Even though clinical protocols of vaccination using immunogenic DC have been tested over the past 15 years to prevent the development of tumors in cancer patients (Correale et al., 2001; Redman et al., 2008), less is known about the potential use of tolerogenic DC in the clinic. A first study published in 2001 demonstrated the feasibility and safety of injecting autologous immature TolDC in healthy volunteers (Dhodapkar et al., 2001). In this study, immature DC were pulsed with peptides and injected by the subcutaneous route into two volunteers. Each individual received a single injection of 2 million cells. The DC injections were well-tolerated without signs of toxicity and no evidence of autoimmunity was detected. Injection of DC was associated with Ag-specific inhibition of effector T cell function and induction of Ag-specific CD8 Tregs in vivo (Dhodapkar et al., 2001; Dhodapkar and Steinman, 2002). The first phase I clinical trial using tolerogenic DC was reported recently in type 1 diabetic patients (Giannoukakis et al., 2011). Ten patients received four intradermal injections of 10 million autologous DC. Three patients received control DC generated in the presence of GM-CSF and IL-4 and seven patients received immunosuppressive DC generated in the presence of GM-CSF, IL-4, and antisense oligonucleotides targeting CD40, CD80, and CD86 transcripts. Use of tolerogenic DC generated with these antisense oligonucleotides was shown previously by the same team to have a preventive and curative effect on diabetes in NOD mice (Machen et al., 2004). This Phase I study demonstrated that intradermal injections of autologous TolDC (both control and immunosuppressive DC) are well-tolerated and safe in diabetic patients; no adverse effects or toxicity was observed. Interestingly, the authors observed a statistically significant increase in frequency of B220+CD11c− lymphocytes in patients treated with autologous TolDC (both control and immunosuppressive DC) during the DC administration period compared to baseline (Giannoukakis et al., 2011). Other clinical trials in autoimmune diseases, and more specifically in rheumatoid arthritis (RA), will begin shortly. The first one will be performed by R. Thomas's team in Australia (University of Queensland). BAY11-7082-treated DC loaded with citrullinated peptides derived from candidate RA auto-antigens will be used (Hilkens et al., 2010). Indeed, in a mouse model of Ag-induced arthritis, the authors previously showed that injection of BAY11-7082 treated Ag-loaded DC suppressed DTH (Delayed Type Hypersensitivity) reactions and arthritis (Martin et al., 2007). BAY11-7082, aNFκB inhibitor, affects DC differentiation, leading to a low expression of MHC Class II and CD40. In vivo injection of BAY11-7082-treated DC prevents priming of immunity and induces IL-10 producing CD4+Tregs (Martin et al., 2003). In parallel, another clinical trial in RA will be performed by CMU Hilkens and JD Isaacs in the UK (University of Newcastle). In this case, autologous DC will be generated with Dexamethasone and VitaminD3 and loaded with synovial fluid (Hilkens et al., 2010). So far there have been no reports of clinical trials using TolDC in transplantation. As part of a European project, we will test the safety of autologous monocyte-derived TolDC in kidney transplant patients. In animal models of transplantation, most studies use donor TolDC or recipient TolDC loaded with donor Ag. In contrast, we have shown the efficacy of unpulsed recipient TolDC to induce tolerance. In humans, the use of autologous TolDC is preferable due to the safety and feasibility of applying this type of DC to a clinic context. In terms of safety, the major risk of donor TolDC injection in transplantation is donor sensitization. Maturation of TolDC after in vivo injection or the presence of a slight contaminant cell product could lead to the development of sensitization of the recipient to the donor Ag. In this case, priming or a higher immune response against the graft could potentially occur at the time of transplantation. Furthermore, another risk of injecting allogeneic cells is non-self recognition by the host immune system. In this context, the injected cells may be deleted by recipient NK cells (Yu et al., 2006). In terms of clinical application in transplantation, the use of autologous TolDC is compatible with both living and deceased donor transplants. Autologous cell therapy could thus be applied to all transplanted organs. Another advantage of using autologous cell therapy is that the cell product could be prepared as soon as the patient is waiting for a transplant and preserved frozen. At the time of transplantation, the cells could be thawed and injected without any preliminary preparations. The use of autologous TolDC is all the more applicable to the clinic as neither the donor nor the time of transplantation have to be planned in advance, in accordance with the use of transplants from deceased donors. Although the preparation and injection of autologous TolDC in patients would be costly, cell therapy is considered as a promising approach. It leads to an induction of Ag-specific tolerance without depleting an entire population of lymphocytes or blocking costimulation molecules. Like IS drugs, one could assume that these efficient but large-scale treatments could potentially induce side effects. Another cheaper alternative approach to induce Ag-specific tolerance would be to deliver donor Ags to quiescent conventional host DC in vivo. This technique was shown to be feasible in mice using either CD205+ DC or DCIR2+ DC (Hawiger et al., 2001; Bonifaz et al., 2002, 2004). In this second model, targeting of donor MHC molecules to DCIR2+ DC led to indefinite survival of MHC Class I mismatched skin grafts (Tanriver et al., 2010). However, it seems that the effect of Ag targeting to DC depends on their state of activation. For example, some studies have shown that injection of Ag coupled to DEC205 and anti-CD40 antibody or TLR ligands initiates immune responses against the targeted Ag (Bonifaz et al., 2004; Boscardin et al., 2006; Trumpfheller et al., 2008). So although this technique targets DC, the induction of tolerance or immunity will depend on whether the DC are immature or mature (Bonifaz et al., 2004). The use of human anti-human DEC205 Ab in vaccination was confirmed in human Ig-expressing transgenic mice (Cheong et al., 2010a). This technique would be useful on the strict condition that DC maturation can be inhibited, to assure that the Ags target only immature DC in humans (Shortman et al., 2009). In contrast, the first clinical trials with injected TolDC described above have proven the safety and absence of toxicity of using autologous DC in humans. The cells that we described above were obtained from the blood of healthy volunteers. For the clinical trial in kidney transplant patients, TolDC will be generated using monocytes from patients with chronic renal failure. Before the beginning of the clinical trial, it is essential to validate our TolDC in these patients. A comparative study of the generation of clinical grade TolDC in healthy volunteers and in RA patients was reported prior to a clinical trial ongoing in RA using autologous TolDC (Harry et al., 2010). Their results showed that TolDC generated from RA patients have a similar phenotype and in vitro function as those generated from healthy controls (Harry et al., 2010). In order to develop immunotherapy for multiple sclerosis, another team described TolDC derived from relapsing-remitting multiple sclerosis (RR-MS) patients. Their results showed that TolDC generated with VitaminD3 from RR-MS patients and from healthy controls display a similar differentiation and function (Raiotach-Regue et al., 2012). 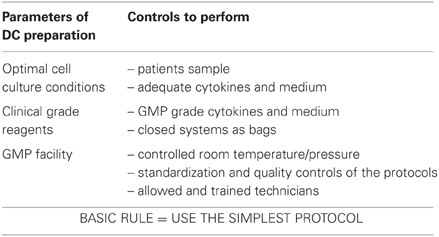 As well as the origin of the samples (volunteers versus patients), other parameters have to be taken into consideration for the GMP preparation of TolDC, as described in Table 2. Table 2. DC preparation conditions. Prior to TolDC injection, different parameters which could influence immunogenicity and survival of the injected cells also have to be defined, as described in Table 3. One of these is the route of DC administration. Experiments performed in mice have shown that intravenous injection of Dex/LPS-treated BMDC prolongs cardiac transplant survival whereas subcutaneous injection of the same Dex/LPS-treated BMDC does not increase graft survival (Emmer et al., 2006). In parallel, our experiments in macaques show that intradermal injection of autologous TolDC prime an immune response while intravenous injection favors a tolerogenic role of these TolDC (unpublished results). A study also performed in monkeys confirmed the fact that intravenous injection of TolDC is well-tolerated (Zahorchak et al., 2007). Table 3. Parameters of DC injection. Another parameter is the potential treatment associated with the cell injection, such as IS drugs. These drugs could either potentiate or inhibit the effect of TolDC in vivo. For the clinical trial in kidney transplantation, cell therapy will be performed in patients treated with several IS drugs. Previous studies have determined the interaction between DC therapy and IS. Indeed, our experiments in a model of transplantation have shown that treatment of rodents with rapamycin or cyclosporin A does not improve the TolDC effect. This is different from the injection of allo-Ag pulsed RAPA-DC in mice that promoted indefinite graft survival when treated with low doses of rapamycin at the time of transplantation (Turnquist et al., 2007). As regards human TolDC, some in vitro studies have shown that rapamycin increases CCR7 expression, which is necessary for TolDC migration to lymphoid organs (Sordi et al., 2006). Other IS, such as calcineurin inhibitors, including cyclosporin A or tacrolimus, block MHC-restricted Ag processing pathways in mouse BMDC in vitro (Lee et al., 2005). In the context of the One Study clinical trial, the patients will receive three IS in combination with the cell therapy: MMF (Mycophenolate mofetil), Tacrolimus and Prednisolone. From a safety point of view, it is necessary to validate that the TolDC will not interfere with the function of these IS. To answer this question, graft survival after injection of each IS with and without TolDC will be monitored in our mouse skin graft model. So far, we have observed that injection of MMF induces a prolongation of graft survival and injection of TolDC does not impair this effect. In fact, a slight increase in graft survival was detected (Segovia et al., in preparation). Similar experiments using the two other IS associated or not with DC therapy are ongoing. The combination of three IS in the presence or absence of cell therapy will be also tested. Cell therapy, e.g., TolDC, is currently considered as an attractive approach to minimize the use of IS in transplantation. Studies performed in rodent models have demonstrated the feasibility and efficacy of TolDC for the induction of tolerance in transplantation. In parallel, protocols to generate human TolDC in vitro have been defined but most have not yet been tested in vivo. New pre-clinical tools, such as humanized mice or non-human primates, have emerged and will be used to help translate the research findings from animal models to clinical application in humans. The authors are grateful for funding support from The One Study and the Foundation Progreffe. Allan, R. S., Waithman, J., Bedoui, S., Jones, C. M., Villadangos, J. A., Zhan, Y., Lew, A. M., Shortman, K., Heath, W. R., and Carbone, F. R. (2006). Migratory dendritic cells transfer antigen to a lymph node-resident dendritic cell population for efficient CTL priming. Immunity 25, 153–162. Ashton-Chess, J., and Blancho, G. (2005). An in vitro evaluation of the potential suitability of peripheral blood CD14(+) and bone marrow CD34(+)-derived dendritic cells for a tolerance inducing regimen in the primate. J. Immunol. Methods 297, 237–252. Asiedu, C., Dong, S. S., Pereboev, A., Wang, W., Navarro, J., Curiel, D. T., and Thomas, J. M. (2002). Rhesus monocyte-derived dendritic cells modified to over-express TGF-beta1 exhibit potent veto activity. Transplantation 74, 629–637. Barratt-Boyes, S. M., Zimmer, M. I., Harshyne, L. A., Meyer, E. M., Watkins, S. C., Capuano, S. 3rd, Murphey-Corb, M., Falo, L. D. Jr., and Donnenberg, A. D. (2000). Maturation and trafficking of monocyte-derived dendritic cells in monkeys: implications for dendritic cell-based vaccines. J. Immunol. 164, 2487–2495. Berger, T. G., Strasser, E., Smith, R., Carste, C., Schuler-Thurner, B., Kaempgen, E., and Schuler, G. (2005). Efficient elutriation of monocytes within a closed system (Elutra) for clinical-scale generation of dendritic cells. J. Immunol. Methods 298, 61–72. Beriou, G., Peche, H., Guillonneau, C., Merieau, E., and Cuturi, M. C. (2005). Donor-specific allograft tolerance by administration of recipient-derived immature dendritic cells and suboptimal immunosuppression. Transplantation 79, 969–972. Bluestone, J. A., Thomson, A. W., Shevach, E. M., and Weiner, H. L. (2007). What does the future hold for cell-based tolerogenic therapy? Nat. Rev. Immunol. 7, 650–654. Bonham, C. A., Peng, L., Liang, X., Chen, Z., Wang, L., Ma, L., Hackstein, H., Robbins, P. D., Thomson, A. W., Fung, J. J., Qian, S., and Lu, L. (2002). Marked prolongation of cardiac allograft survival by dendritic cells genetically engineered with NF-kappa B oligodeoxyribonucleotide decoys and adenoviral vectors encoding CTLA4-Ig. J. Immunol. 169, 3382–3391. Bonifaz, L., Bonnyay, D., Mahnke, K., Rivera, M., Nussenzweig, M. C., and Steinman, R. M. (2002). Efficient targeting of protein antigen to the dendritic cell receptor DEC-205 in the steady state leads to antigen presentation on major histocompatibility complex class I products and peripheral CD8+ T cell tolerance. J. Exp. Med. 196, 1627–1638. Bonifaz, L. C., Bonnyay, D. P., Charalambous, A., Darguste, D. I., Fujii, S., Soares, H., Brimnes, M. K., Moltedo, B., Moran, T. M., and Steinman, R. M. (2004). in vivo targeting of antigens to maturing dendritic cells via the DEC-205 receptor improves T cell vaccination. J. Exp. Med. 199, 815–824. Boscardin, S. B., Hafalla, J. C., Masilamani, R. F., Kamphorst, A. O., Zebroski, H. A., Rai, U., Morrot, A., Zavala, F., Steinman, R. M., Nussenzweig, R. S., and Nussenzweig, M. C. (2006). Antigen targeting to dendritic cells elicits long-lived T cell help for antibody responses. J. Exp. Med. 203, 599–606. Chaturvedi, V., Collison, L. W., Guy, C. S., Workman, C. J., and Vignali, D. A. (2011). Cutting edge: LC human regulatory T cells require IL-35 to mediate suppression and infectious tolerance. J. Immunol. 186, 6661–6666. Chauveau, C., Remy, S., Royer, P. J., Hill, M., Tanguy-Royer, S., Hubert, F. X., Tesson, L., Brion, R., Beriou, G., Gregoire, M., Josien, R., Cuturi, M. C., and Anegon, I. (2005). Heme oxygenase-1 expression inhibits dendritic cell maturation and proinflammatory function but conserves IL-10 expression. Blood 106, 1694–1702. Cheong, C., Choi, J. H., Vitale, L., He, L. Z., Trumpfheller, C., Bozzacco, L., Do, Y., Nchinda, G., Park, S. H., Dandamudi, D. B., Shrestha, E., Pack, M., Lee, H. W., Keler, T., Steinman, R. M., and Park, C. G. (2010a). Improved cellular and humoral immune responses in vivo following targeting of HIV Gag to dendritic cells within human anti-human DEC205 monoclonal antibody. Blood 116, 3828–3838. Cheong, C., Matos, I., Choi, J. H., Dandamudi, D. B., Shrestha, E., Longhi, M. P., Jeffrey, K. L., Anthony, R. M., Kluger, C., Nchinda, G., Koh, H., Rodriguez, A., Idoyaga, J., Pack, M., Velinzon, K., Park, C. G., and Steinman, R. M. (2010b). Microbial stimulation fully differentiates monocytes to DC-SIGN/CD209(+) dendritic cells for immune T cell areas. Cell 143, 416–429. Chitta, S., Santambrogio, L., and Stern, L. J. (2008). GMCSF in the absence of other cytokines sustains human dendritic cell precursors with T cell regulatory activity and capacity to differentiate into functional dendritic cells. Immunol. Lett. 116, 41–54. Collison, L. W., Chaturvedi, V., Henderson, A. L., Giacomin, P. R., Guy, C., Bankoti, J., Finkelstein, D., Forbes, K., Workman, C. J., Brown, S. A., Rehg, J. E., Jones, M. L., Ni, H. T., Artis, D., Turk, M. J., and Vignali, D. A. (2010). IL-35-mediated induction of a potent regulatory T cell population. Nat. Immunol. 11, 1093–1101. Collison, L. W., Workman, C. J., Kuo, T. T., Boyd, K., Wang, Y., Vignali, K. M., Cross, R., Sehy, D., Blumberg, R. S., and Vignali, D. A. (2007). The inhibitory cytokine IL-35 contributes to regulatory T-cell function. Nature 450, 566–569. Correale, P., Campoccia, G., Tsang, K. Y., Micheli, L., Cusi, M. G., Sabatino, M., Bruni, G., Sestini, S., Petrioli, R., Pozzessere, D., Marsili, S., Fanetti, G., Giorgi, G., and Francini, G. (2001). Recruitment of dendritic cells and enhanced antigen-specific immune reactivity in cancer patients treated with hr-GM-CSF (Molgramostim) and hr-IL-2. results from a phase Ib clinical trial. Eur. J. Cancer 37, 892–902. Dantal, J., Hourmant, M., Cantarovich, D., Giral, M., Blancho, G., Dreno, B., and Soulillou, J. P. (1998). Effect of long-term immunosuppression in kidney-graft recipients on cancer incidence: randomised comparison of two cyclosporin regimens. Lancet 351, 623–628. den Haan, J. M., Lehar, S. M., and Bevan, M. J. (2000). CD8(+) but not CD8(-) dendritic cells cross-prime cytotoxic T cells in vivo. J. Exp. Med. 192, 1685–1696. Dhodapkar, M. V., and Steinman, R. M. (2002). Antigen-bearing immature dendritic cells induce peptide-specific CD8(+) regulatory T cells in vivo in humans. Blood 100, 174–177. Dhodapkar, M. V., Steinman, R. M., Krasovsky, J., Munz, C., and Bhardwaj, N. (2001). Antigen-specific inhibition of effector T cell function in humans after injection of immature dendritic cells. J. Exp. Med. 193, 233–238. Divito, S. J., Wang, Z., Shufesky, W. J., Liu, Q., Tkacheva, O. A., Montecalvo, A., Erdos, G., Larregina, A. T., and Morelli, A. E. (2010). Endogenous dendritic cells mediate the effects of intravenously injected therapeutic immunosuppressive dendritic cells in transplantation. Blood 116, 2694–2705. Dudziak, D., Kamphorst, A. O., Heidkamp, G. F., Buchholz, V. R., Trumpfheller, C., Yamazaki, S., Cheong, C., Liu, K., Lee, H. W., Park, C. G., Steinman, R. M., and Nussenzweig, M. C. (2007). Differential antigen processing by dendritic cell subsets in vivo. Science 315, 107–111. Emmer, P. M., van der Vlag, J., Adema, G. J., and Hilbrands, L. B. (2006). Dendritic cells activated by lipopolysaccharide after dexamethasone treatment induce donor-specific allograft hyporesponsiveness. Transplantation 81, 1451–1459. Ezzelarab, M., and Thomson, A. W. (2011). Tolerogenic dendritic cells and their role in transplantation. Semin. Immunol. 23, 252–263. Fujita, S., Sato, Y., Sato, K., Eizumi, K., Fukaya, T., Kubo, M., and Yamashita, N. (2007). Regulatory dendritic cells protect against cutaneous chronic graft-versus-host disease mediated through CD4+CD25+Foxp3+ regulatory T cells. Blood 110, 3793–3803. Garrod, K. R., Chang, C. K., Liu, F. C., Brennan, T. V., Foster, R. D., and Kang, S. M. (2006). Targeted lymphoid homing of dendritic cells is required for prolongation of allograft survival. J. Immunol. 177, 863–868. Giannoukakis, N., Bonham, C. A., Qian, S., Chen, Z., Peng, L., Harnaha, J., Li, W., Thomson, A. W., Fung, J. J., Robbins, P. D., and Lu, L. (2000). Prolongation of cardiac allograft survival using dendritic cells treated with NF-κB decoy oligodeoxyribonucleotides. Mol. Ther. 1, 430–437. Giannoukakis, N., Phillips, B., Finegold, D., Harnaha, J., and Trucco, M. (2011). Phase, I (safety) study of autologous tolerogenic dendritic cells in type 1 diabetic patients. Diabetes Care 34, 2026–2032. Gregori, S., Tomasoni, D., Pacciani, V., Scirpoli, M., Battaglia, M., Magnani, C. F., Hauben, E., and Roncarolo, M. G. (2010). Differentiation of type 1 T regulatory cells (Tr1) by tolerogenic DC-10 requires the IL-10-dependent ILT4/HLA-G pathway. Blood 116, 935–944. Griffin, M. D., Lutz, W., Phan, V. A., Bachman, L. A., McKean, D. J., and Kumar, R. (2001). Dendritic cell modulation by 1alpha, 25 dihydroxyvitamin D3 and its analogs: a vitamin D receptor-dependent pathway that promotes a persistent state of immaturity in vitro and in vivo. Proc. Natl. Acad. Sci. U.S.A. 98, 6800–6805. Harry, R. A., Anderson, A. E., Isaacs, J. D., and Hilkens, C. M. (2010). Generation and characterisation of therapeutic tolerogenic dendritic cells for rheumatoid arthritis. Ann. Rheum. Dis. 69, 2042–2050. Hawiger, D., Inaba, K., Dorsett, Y., Guo, M., Mahnke, K., Rivera, M., Ravetch, J. V., Steinman, R. M., and Nussenzweig, M. C. (2001). Dendritic cells induce peripheral T cell unresponsiveness under steady state conditions in vivo. J. Exp. Med. 194, 769–779. Herrera, O. B., Golshayan, D., Tibbott, R., Salcido Ochoa, F., James, M. J., Marelli-Berg, F. M., and Lechler, R. I. (2004). A novel pathway of alloantigen presentation by dendritic cells. J. Immunol. 173, 4828–4837. Hilkens, C. M., Isaacs, J. D., and Thomson, A. W. (2010). Development of dendritic cell-based immunotherapy for autoimmunity. Int. Rev. Immunol. 29, 156–183. Hill, M., Tanguy-Royer, S., Royer, P., Chauveau, C., Asghar, K., Tesson, L., Lavainne, F., Remy, S., Brion, R., Hubert, F. X., Heslan, M., Rimbert, M., Berthelot, L., Moffett, J. R., Josien, R., Gregoire, M., and Anegon, I. (2007). IDO expands human CD4+CD25high regulatory T cells by promoting maturation of LPS-treated dendritic cells. Eur. J. Immunol. 37, 3054–3062. Hill, M., Thebault, P., Segovia, M., Louvet, C., Beriou, G., Tilly, G., Merieau, E., Anegon, I., Chiffoleau, E., and Cuturi, M. C. (2011). Cell therapy with autologous tolerogenic dendritic cells induces allograft tolerance through interferon-gamma and epstein-barr virus-induced gene 3. Am. J. Transplant 11, 2036–2045. Hochrein, H., Shortman, K., Vremec, D., Scott, B., Hertzog, P., and O'Keeffe, M. (2001). Differential production of IL-12, IFN-alpha, and IFN-gamma by mouse dendritic cell subsets. J. Immunol. 166, 5448–5455. Ilarregui, J. M., Croci, D. O., Bianco, G. A., Toscano, M. A., Salatino, M., Vermeulen, M. E., Geffner, J. R., and Rabinovich, G. A. (2009). Tolerogenic signals delivered by dendritic cells to T cells through a galectin-1-driven immunoregulatory circuit involving interleukin 27 and interleukin 10. Nat. Immunol. 10, 981–991. Kendal, A. R., Chen, Y., Regateiro, F. S., Ma, J., Adams, E., Cobbold, S. P., Hori, S., and Waldmann, H. (2011). Sustained suppression by Foxp3+ regulatory T cells is vital for infectious transplantation tolerance. J. Exp. Med. 208, 2043–2053. Kenna, T. J., Thomas, R., and Steptoe, R. J. (2008). Steady-state dendritic cells expressing cognate antigen terminate memory CD8+ T-cell responses. Blood 111, 2091–2100. Lechler, R., Chai, J. G., Marelli-Berg, F., and Lombardi, G. (2001). The contributions of T-cell anergy to peripheral T-cell tolerance. Immunology 103, 262–269. Lee, Y. R., Yang, I. H., Lee, Y. H., Im, S. A., Song, S., Li, H., Han, K., Kim, K., Eo, S. K., and Lee, C. K. (2005). Cyclosporin A and tacrolimus, but not rapamycin, inhibit MHC-restricted antigen presentation pathways in dendritic cells. Blood 105, 3951–3955. Li, M., Zhang, X., Zheng, X., Lian, D., Zhang, Z. X., Ge, W., Yang, J., Vladau, C., Suzuki, M., Chen, D., Zhong, R., Garcia, B., Jevnikar, A. M., and Min, W. P. (2007). Immune modulation and tolerance induction by RelB-silenced dendritic cells through RNA interference. J. Immunol. 178, 5480–5487. Lu, L., Qian, S., Hershberger, P. A., Rudert, W. A., Lynch, D. H., and Thomson, A. W. (1997). Fas ligand (CD95L) and B7 expression on dendritic cells provide counter-regulatory signals for T cell survival and proliferation. J. Immunol. 158, 5676–5684. Lutz, M. B., Suri, R. M., Niimi, M., Ogilvie, A. L., Kukutsch, N. A., Rossner, S., Schuler, G., and Austyn, J. M. (2000). Immature dendritic cells generated with low doses of GM-CSF in the absence of IL-4 are maturation resistant and prolong allograft survival in vivo. Eur. J. Immunol. 30, 1813–1822. Machen, J., Harnaha, J., Lakomy, R., Styche, A., Trucco, M., and Giannoukakis, N. (2004). Antisense oligonucleotides down-regulating costimulation confer diabetes-preventive properties to nonobese diabetic mouse dendritic cells. J. Immunol. 173, 4331–4341. Marti, H. P., Henschkowski, J., Laux, G., Vogt, B., Seiler, C., Opelz, G., and Frey, F. J. (2006). Effect of donor-specific transfusions on the outcome of renal allografts in the cyclo- sporine era. Transpl. Int. 19, 19–26. Martin, E., Capini, C., Duggan, E., Lutzky, V. P., Stumbles, P., Pettit, A. R., O'Sullivan, B., and Thomas, R. (2007). Antigen-specific suppression of established arthritis in mice by dendritic cells deficient in NF-kappaB. Arthritis Rheum. 56, 2255–2266. Martin, E., O'Sullivan, B., Low, P., and Thomas, R. (2003). Antigen-specific suppression of a primed immune response by dendritic cells mediated by regulatory T cells secreting interleukin-10. Immunity 18, 155–167. Mellor, A. L., Baban, B., Chandler, P., Marshall, B., Jhaver, K., Hansen, A., Koni, P. A., Iwashima, M., and Munn, D. H. (2003). Cutting edge: induced indoleamine 2, 3 dioxygenase expression in dendritic cell subsets suppresses T cell clonal expansion. J. Immunol. 171, 1652–1655. Min, W. P., Gorczynski, R., Huang, X. Y., Kushida, M., Kim, P., Obataki, M., Lei, J., Rakesh, M. S., and Cattral, M. S. (2000). Dendritic cells genetically engineered to express Fas ligand induce donor-specific hyporesponsiveness and prolong allograft survival. J. Immunol. 164, 161–167. Moreau, A., Chiffoleau, E., Beriou, G., Deschamps, J. Y., Heslan, M., Ashton-Chess, J., Rolling, F., Josien, R., Moullier, P., Cuturi, M. C., and Alliot-Licht, B. (2008). Superiority of bone marrow-derived dendritic cells over monocyte-derived ones for the expansion of regulatory T cells in the macaque. Transplantation 85, 1351–1356. Moreau, A., Hill, M., Thebault, P., Deschamps, J. Y., Chiffoleau, E., Chauveau, C., Moullier, P., Anegon, I., Alliot-Licht, B., and Cuturi, M. C. (2009). Tolerogenic dendritic cells actively inhibit T cells through heme oxygenase-1 in rodents and in nonhuman primates. FASEB J. 23, 3070–3077. Morelli, A. E., and Thomson, A. W. (2007). Tolerogenic dendritic cells and the quest for transplant tolerance. Nat. Rev. Immunol. 7, 610–621. Mortara, L., Ploquin, M. J., Faye, A., Scott-Algara, D., Vaslin, B., Butor, C., Hosmalin, A., Barre-Sinoussi, F., Diop, O. M., and Muller-Trutwin, M. C. (2006). Phenotype and function of myeloid dendritic cells derived from African green monkey blood monocytes. J. Immunol. Methods 308, 138–155. Niedbala, W., Wei, X. Q., Cai, B., Hueber, A. J., Leung, B. P., Mcinnes, I. B., and Liew, F. Y. (2007). IL-35 is a novel cytokine with therapeutic effects against collagen-induced arthritis through the expansion of regulatory T cells and suppression of Th17 cells. Eur. J. Immunol. 37, 3021–3029. O'Doherty, U., Ignatius, R., Bhardwaj, N., and Pope, M. (1997). Generation of monocyte-derived dendritic cells from precursors in rhesus macaque blood. J. Immunol. Methods 207, 185–194. Peche, H., Trinite, B., Martinet, B., and Cuturi, M. C. (2005). Prolongation of heart allograft survival by immature dendritic cells generated from recipient type bone marrow progenitors. Am. J. Transplant 5, 255–267. Pinchuk, L. M., Grouard-Vogel, G., Magaletti, D. M., Doty, R. T., Andrews, R. G., and Clark, E. A. (1999). Isolation and characterization of macaque dendritic cells from CD34(+) bone marrow progenitors. Cell. Immunol. 196, 34–40. Probst, H. C., Lagnel, J., Kollias, G., and van den Broek, M. (2003). Inducible transgenic mice reveal resting dendritic cells as potent inducers of CD8+ T cell tolerance. Immunity 18, 713–720. Raiotach-Regue, D., Grau-Lopez, L., Naranjo-Gomez, M., Ramo-Tello, C., Pujol-Borrell, R., Martinez-Caceres, E., and Borras, F. E. (2012). Stable antigen-specific T-cell hyporesponsiveness induced by tolerogenic dendritic cells from multiple sclerosis patients. Eur. J. Immunol. 42, 771–782. Redman, B. G., Chang, A. E., Whitfield, J., Esper, P., Jiang, G., Braun, T., Roessler, B., and Mule, J. J. (2008). Phase Ib trial assessing autologous, tumor-pulsed dendritic cells as a vaccine administered with or without IL-2 in patients with metastatic melanoma. J. Immunother. 31, 591–598. Reis e Sousa, C., Hieny, S., Scharton-Kersten, T., Jankovic, D., Charest, H., Germain, R. N., and Sher, A. (1997). In vivo microbial stimulation induces rapid CD40 ligand-independent production of interleukin 12 by dendritic cells and their redistribution to T cell areas. J. Exp. Med. 186, 1819–1829. Schwartz, R. H. (1997). T cell clonal anergy. Curr. Opin. Immunol. 9, 351–357. Segovia, M., Cuturi, M. C., and Hill, M. (2011). Preparation of mouse bone marrow-derived dendritic cells with immunoregulatory properties. Methods Mol. Biol. 677, 161–168. Sharma, R. K., Rai, P. K., Kumar, A., Kumar, P., Gupta, A., Kher, V., Agrawal, S., and Bhandari, M. (1997). Role of preoperative donor-specific transfusion and cyclosporine in haplo-identical living related renal transplant recipients. Nephron 75, 20–24. Shortman, K., Lahoud, M. H., and Caminschi, I. (2009). Improving vaccines by targeting antigens to dendritic cells. Exp. Mol. Med. 41, 61–66. Shortman, K., and Naik, S. H. (2007). Steady-state and inflammatory dendritic-cell development. Nat. Rev. Immunol. 7, 19–30. Smyth, L. A., Herrera, O. B., Golshayan, D., Lombardi, G., and Lechler, R. I. (2006). A novel pathway of antigen presentation by dendritic and endothelial cells: implications for allorecognition and infectious diseases. Transplantation 82, S15–S18. Sordi, V., Bianchi, G., Buracchi, C., Mercalli, A., Marchesi, F., D'Amico, G., Yang, C. H., Luini, W., Vecchi, A., Mantovani, A., Allavena, P., and Piemonti, L. (2006). Differential effects of immunosuppressive drugs on chemokine receptor CCR7 in human monocyte-derived dendritic cells: selective upregulation by rapamycin. Transplantation 82, 826–834. Tanriver, Y., Ratnasothy, K., Bucy, R. P., Lombardi, G., and Lechler, R. (2010). Targeting MHC class I monomers to dendritic cells inhibits the indirect pathway of allorecognition and the production of IgG alloantibodies leading to long-term allograft survival. J. Immunol. 184, 1757–1764. Trumpfheller, C., Caskey, M., Nchinda, G., Longhi, M. P., Mizenina, O., Huang, Y., Schlesinger, S. J., Colonna, M., and Steinman, R. M. (2008). The microbial mimic poly IC induces durable and protective CD4+ T cell immunity together with a dendritic cell targeted vaccine. Proc. Natl. Acad. Sci. U.S.A. 105, 2574–2579. Turnquist, H. R., Cardinal, J., Macedo, C., Rosborough, B. R., Sumpter, T. L., Geller, D. A., Metes, D., and Thomson, A. W. (2010). mTOR and GSK-3 shape the CD4+ T-cell stimulatory and differentiation capacity of myeloid DCs after exposure to LPS. Blood 115, 4758–4769. Turnquist, H. R., Raimondi, G., Zahorchak, A. F., Fischer, R. T., Wang, Z., and Thomson, A. W. (2007). Rapamycin-conditioned dendritic cells are poor stimulators of allogeneic CD4+ T cells, but enrich for antigen-specific Foxp3+ T regulatory cells and promote organ transplant tolerance. J. Immunol. 178, 7018–7031. Wakkach, A., Fournier, N., Brun, V., Breittmayer, J. P., Cottrez, F., and Groux, H. (2003). Characterization of dendritic cells that induce tolerance and T regulatory 1 cell differentiation in vivo. Immunity 18, 605–617. Wang, Z., Divito, S. J., Shufesky, W. J., Sumpter, T., Wang, H., Tkacheva, O. A., Wang, W., Liu, C., Larregina, A. T., and Morelli, A. E. (2012). Dendritic cell therapies in transplantation revisited: deletion of recipient DCs deters the effect of therapeutic DCs. Am. J. Transplant. doi: 10.1111/j.1600-6143.2012.04060.x. [Epub ahead of print]. Yamano, T., Watanabe, S., Hasegawa, H., Suzuki, T., Abe, R., Tahara, H., Nitta, T., Ishimaru, N., Sprent, J., and Kishimoto, H. (2011). Ex vivo-expanded DCs induce donor-specific central and peripheral tolerance and prolong the acceptance of donor skin grafts. Blood 117, 2640–2648. Yamazaki, S., Iyoda, T., Tarbell, K., Olson, K., Velinzon, K., Inaba, K., and Steinman, R. M. (2003). Direct expansion of functional CD25+ CD4+ regulatory T cells by antigen-processing dendritic cells. J. Exp. Med. 198, 235–247. Yang, J., Bernier, S. M., Ichim, T. E., Li, M., Xia, X., Zhou, D., Huang, X., Strejan, G. H., White, D. J., Zhong, R., and Min, W. P. (2003). LF15-0195 generates tolerogenic dendritic cells by suppression of NF-kappaB signaling through inhibition of IKK activity. J. Leukoc. Biol. 74, 438–447. Yu, G., Xu, X., Vu, M. D., Kilpatrick, E. D., and Li, X. C. (2006). NK cells promote transplant tolerance by killing donor antigen-presenting cells. J. Exp. Med. 203, 1851–1858. Zahorchak, A. F., Kean, L. S., Tokita, D., Turnquist, H. R., Abe, M., Finke, J., Hamby, K., Rigby, M. R., Larsen, C. P., and Thomson, A. W. (2007). Infusion of stably immature monocyte-derived dendritic cells plus CTLA4Ig modulates alloimmune reactivity in rhesus macaques. Transplantation 84, 196–206. Published online: 09 August 2012. Copyright © 2012 Moreau, Varey, Bériou, Hill, Bouchet-Delbos, Segovia and Cuturi. This is an open-access article distributed under the terms of the Creative Commons Attribution License, which permits use, distribution and reproduction in other forums, provided the original authors and source are credited and subject to any copyright notices concerning any third-party graphics etc.